Woodcarving hand tools are part of a time-honored craft. It is one of the oldest forms of art on the planet and practicing it is almost therapeutic. Below, you’ll find some tips for working with woodcarving tools. You’ll notice that many of them deal with safety – after all, these are sharp tools that can cause a serious injury if they are not handled properly. Keep a first aid kit close by because a nick or a cut is almost guaranteed at some point! One of the most important things to remember when using a knife is to use your wrist and not your elbow to move it. When you use your wrist, you will have better control and take out smaller pieces of wood. Trying to remove large chunks of wood usually just succeeds in sending the knife flying through the air. Always keep the knife blade sharp and try to cut down instead of across. Avoid using a knife as a scraper, as it will quickly dull the blade. Also, don’t use the tip of the knife to pry off any wood; this usually results in a broken knife tip. Before you start using those new woodcarving hand tools, get your pencil out. It’s much easier to erase a mark with a pencil than it is to correct a cut that is too deep. Drawing a centerline in the middle of your stock helps to keep the sides balanced. You’ll also be surprised at how easily your creative side comes through when you have a pencil in your hands. You can use a variety of woods when carving, but if you’re just starting out, you may want to consider basswood. If you don’t plan on painting the finished project, then butternut is a good choice. A more expensive wood is Tupelo, but it has some great qualities for carving. Before you make any cuts in your wood, determine which way the grain runs. You want to carve with the grain. It is very easy to tear away pieces of the wood when you’re fist starting out, but this can lead to removing too much wood. Working with the grain makes these tears (and crying tears) a bit easier, but practice will lead to perfection and fewer handkerchiefs! This choice is nothing more than your preference for painted or stained wood. Both methods require a sealant to prevent resins from within the wood coming to the surface. These resins usually appear from any knots in the wood. If you do decide to paint the project, apply a sealant first. Painting without sealing first, will create a thinly coated, color altered mess as the wood soaks up the paint. A sealant should be applied first so the porous wood will not soak up the paint. You can use an acrylic paint or an oil based paint. In order to get the thickness you want, you may need to mix the paint with a bit of water or linseed oil. An antique look is often accomplished by using a mixture of burnt umber and boiled linseed oil. It is recommended that you use at least one coat of a polyurethane finish to keep the paint from flaking. This is much easier said than done. However, when you’re working with woodcarving hand tools for the first few times, there is a chance that your projects may not turn out exactly as you wanted. This is the time to learn from your mistakes though, and to use what you have learned in your next project. Don’t be afraid to ask questions or even attend some woodcarving classes. 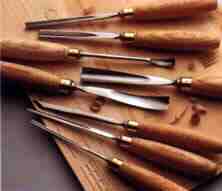 This will only help to increase your skill level to make the most of your woodcarving hand tools.